We were in San Francisco yesterday, where it was a balmy 73° F. Quite a few folks I hear from online think this temp is the norm for California, but please don’t judge California by San Francisco norms. It topped the mercury at 116°F at our house, 3½ hours to the north and inland. Not to be outdone, in Death Valley, California, it reached 129° F.
We weren’t home on the hottest day so far this year, but today has been nearly as toasty. Triple digit heat is all a part of the normal summer for us. 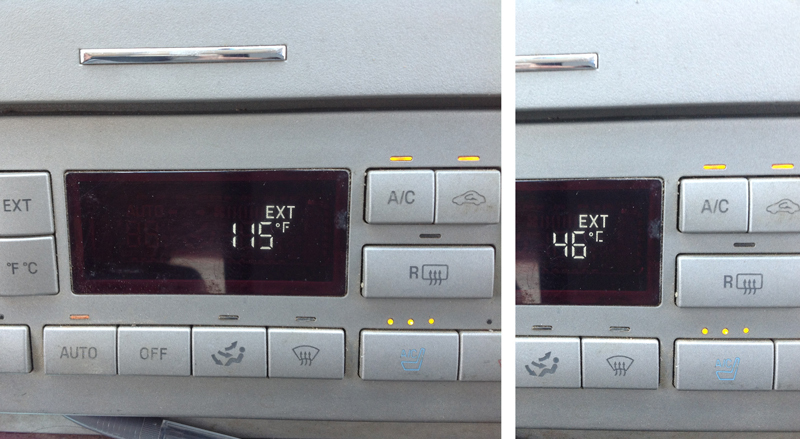 As we drove up the valley on the I-5 corridor the outside temperature quickly rose to 115° F / 46°C. Not the hottest temp this year, but still pretty toasty. Welcome to Northern California summers. This entry was posted in Bliss Tips, My Backyard, Nature and tagged California heat wave, Death Valley, heat, Sacramento Valley, San Francisco by MaryALivingston. Bookmark the permalink. And here at sea level on the equator i’m having to add a sweatshirt to stay warm at night this week! I used to live in San Francisco and I loved this time of year – sweatshirts and all. When the afternoon fog would blow in during July, it got nice and chilly. We were only there a few days – wow, what a difference between SF and home! Nope, not the hottest in our area, the day before was 116. Our hottest recorded at our house was 118 a few years back. We are in Northern CA. In Southern CA, in July 1913 Death Valley recorded a high of 134, it is still the all time world record for heat. We can have reare days in Summer when it gets that hot, and they are rated ‘Extreme Fire Danger’ days where people are advised to either be fully prepared to fight a fire or else leave the area for somewhere safer. It was my first experience of this last Summer. How do you go in your area for fire danger? Is it forested or mainly tree-free? Locally, in the foothills and north end of the Sacramento Valley, we have oak woodland. Yes, it burns. As the elevation climbs into the mountains, the terrain changes to conifer forests. Fire danger is extremely high. The highest fire risks comes from lightning and careless people. Wildfire is a part of life in the west. Fighting fire is very dangerous, recently 19 firefighters died fighting a blaze in Arizona. Every year, in California, we have summer drought and our land is like a tinder-box. Because of the constant threat of wildfire, Tim and I wrote a book about it FireStorm in the Forest.